Prince Collin and his friends defeated Vanestra, and thought evil had been banashed from the castle forever. But deep withing those scorched and shadow-haunted halls, something is moving that should not be. A malicious presence has taken root, and it has hatched a scheme that will ensare the Prince and his friends, and forever change the course of history for the mouse-town of Barksburg. 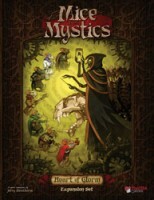 A New Storybook For Mice and Mystics! The Heart of Glorm storybook picks up right after the events of Sorrow and Remembrance, letting you and your friends continue the story of Prince Collin, Maginos, Tilda, Nez, Filch and Lily. Included in this expansion are new plastic figures, cards and counters, as well as a new series of chapters sure to test your mettle! And joining the heroes is Neré, a wild mystic who brings her powerful magic and knowledge of alchemy to the battle. This expansion set requires Mice and Mystics: Sorrow and Remembrance to play. 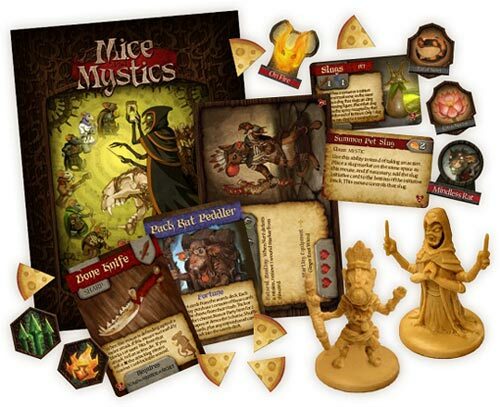 Add a Review for "Mice and Mystics: Heart of Glorm"